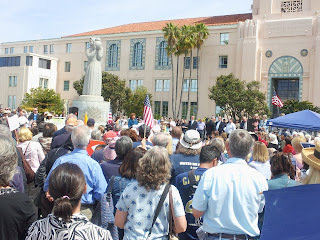 I went to the Stand Up for Religious Freedom Rally last Friday in downtown San Diego. I was struck by how impassioned both the speakers and participants were. The President’s policies are uniting people of faith against him. The speakers all spoke of the importance of freedom and conscience to the proper functioning of government. They spoke of the continued assault on religious liberty. 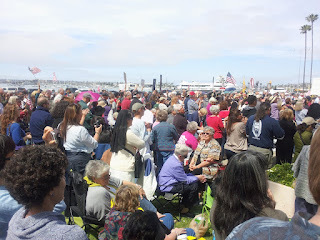 They spoke of the laughable accounting shell game of the administration: “Religious associations don’t have to pay for birth control, only their insurers will be required to provide that.” My personal estimate was that about 700 people turned up. We got honks of support throughout the rally. “Religious freedom is not a gift from politicians: It is a gift from God,” said Bishop Flores. “Today’s debate is not about the access to contraceptives…it is about the federal government forcing the Church to act against its teachings”. Great post! I was there as well, and you really captured the essence of it. Most importantly you got that great quote from Bishop Flores. I find this ridiculous. Someone’s employer should not be able to determine what kind of medication they can take. Birth control pills are not always used to prevent pregnancy. There are many other reasons to take them. If you’re against birth control, then don’t take it. No one says you have to use it simply because it’s available. But no one here is talking about how Viagra is covered by insurance and available by prescription. Lori, the employer is paying for the plan, so the employer should have full authority over what’s in the plan, including meds. One more reason to divorce insurance from employment. BTW if the government runs health care then you will have no say on what is covered. The employer also pays the salary, does that mean that if an employee goes and buys contraception with their salary, that they are violating their employer’s religious freedoms? Are health benefits paid to the employee as compensation for the employees work, and thus belong to the employee just as their salary does, or do employers just hand over the health benefits for free, and thus belong to the employer? If sans health benefits, an employer must pay an employee a greater wage (to match what would be comparable in the market, e.g. higher wages for contractors who receive no health benefits), then it seems that the health benefits are just one of the forms of payment that the employer pays the employee in exchange for the employees work. It seems to me that health benefits are like wages, and both belong to the employee because both of them are in exchange for the employees work, and the employee should be able to use them as they see fit. Health benefits are only like wages in that it costs the employer money in both cases. However, health benefits are not in fact wages. Employer provided health insurance is akin to employer provided disability insurance. It covers what it covers, at the employers discretion. If you don’t like it… get a new job OR keep your job pay for the whopping $5 to $9/mo for the birth control pill yourself. I never said health benefits are wages. I said health benefits are compensation for work provided, just as wages are compensation for work provided. Therefore, if the wages belong to the employee, and use of these wages to buy contraceptives would not be a violation of the employer’s religious beliefs, and health benefits belong to the employee, then use of these health benefits to obtain contraceptives would not be a violation of the employer’s religious beliefs. Paul, if the employer simply gave the employee additional money to purchase his/her own health insurance, you may have a point. However, that is not how it works and the employer, not the employee, is generally given the choice of which health insurance policy to provide. Jim, why should only faith-based organizations be exempt from paying for things that violate their conscience? By your reasoning, shouldn’t a conscientious objector be allowed not to pay taxes that support wars? One last question, if an employer was a Jehovah’s Witness, should he/she be allowed to exclude blood transfusions from the company’s health insurance policy? There should not be any mandatory coverage in any health care plan. It all should be subject to negotiation. Employers, employees and unions should be free to work out what is covered or nor based on their needs and dictates of their conscience. With respect to taxes supporting war; that is a different question, because the constitution provides that going to war and paying for the cost of the military is solely the responsibility of Congress, along with the power to tax. There is no constitutional mandate for the Congress to regulate health insurance. Good points, but how do you both feel about being forced to pay for social programs you don’t believe in? For example, should a devout Catholic’s taxes (State or Federal) go to programs that help un-wed mothers? Should an Amish man have to pay taxes that go to support scientific research?